^ a b c Lingeman, Richard (August 13, 1995). "How to Lose Friends and Alienate People". New York Times. Retrieved 31 January 2017. ^ a b c Emmert, J. M. (January 5, 2009). "The Story of Napoleon Hill". Success. Retrieved 25 March 2017. ^ "TWO WARRANTS OUT FOR MODEST NAPOLEON HILL". Chicago Daily Tribune. 4 June 1918. Retrieved 31 January 2017. 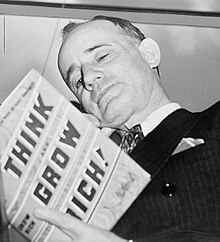 ^ "Napoleon Hill Timeline". Napoleon Hill Foundation. Retrieved 25 March 2017.